Meet Manuel Laverde. Manuel moved to the U.S. from Colombia two years ago. Since then, he has been pursuing his education at Fullerton College. He has taken several ESL classes and is currently taking ESL 190 with Professor Navarro. Manuel credits his ESL classes for building his confidence so that he is more able to participate in his other classes. He says that his confidence has opened up many opportunities that allow him to accomplish his dreams. One of those dreams is to pursue a degree in music performance and composition. He started playing the piano early in his life, and he enjoys the classical works of Bach and Beethoven. 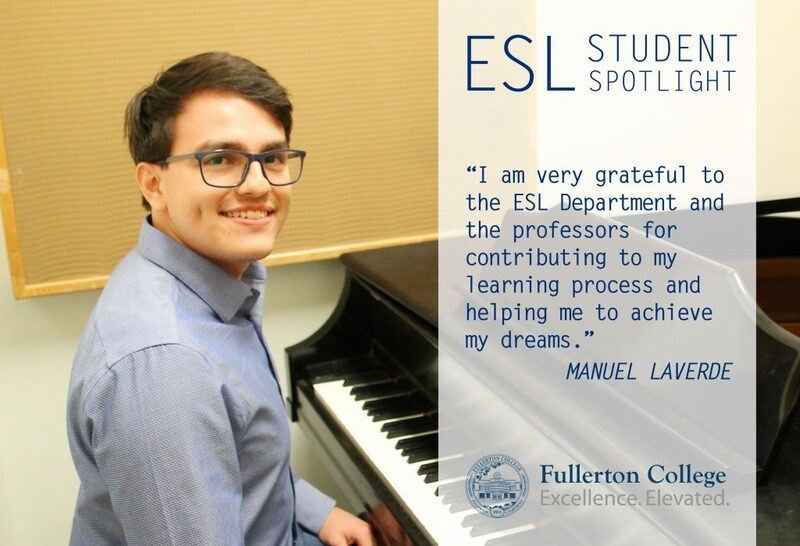 He said, “I am very grateful to the ESL department and the professors for contributing to my learning process and helping me to achieve my dreams.” His work in his ESL classes earned him the ESL Student Achievement Award at last spring’s Humanities Division Tea Awards Ceremony.